Participants of the 2015 Best Buddies Friendship Walk. Be a part of change and participate in the Best Buddies Friendship Walk #BBFW15! Illinois State’s chapter of Best Buddies will host #BBFW15 on Saturday, April 25, on the Quad. Community members are encouraged to register to walk or to sponsor a participant. The effort raises awareness and funds for the inclusion of individuals with intellectual or developmental disabilities in the community, and has a far-reaching impact on everyone involved. Hundreds of individuals from the Illinois State chapter walked in the event last year, and Best Buddies is working hard to grow the event this year! Following the walk, participants are encouraged to stay for the #BBFW15 festival featuring music, food, fun and games for all ages. Best Buddies at Illinois State is part of the international organization that joins each of the organization’s 100-plus student members across all majors with individuals with an intellectual or developmental disability. The result is powerful, mutually beneficial friendships that enrich the lives of both people and challenges community members to adopt evolved perspectives on the value of inclusion. Buddies participate in the organization’s monthly socials and regularly talk on the phone and hang out in the community separately from the larger group. If you live in Bloomington-Normal, chances are you have seen Best Buddies out and about in our community! 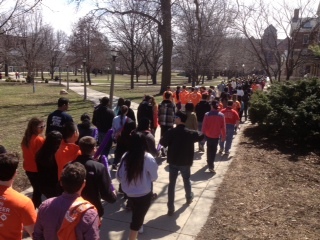 Hundreds of supporters came out to participate in the Best Buddies Friendship Walk in 2014. The organization is hoping to continue to raise awareness with an even larger crowd on April 25. Register to walk or sponsor a participant!